For this project, our client asked for a rooftop garden fit to hold parties and fundraisers. As you can see in the photos below, we designed custom planters with built-in benches. Above is a planter we planted in the style of a meadow. Above that, you'll see a custom painted green house and to the left, and in the photo below, a small but prominent vegetable garden. This is a view of the planters from inside the greenhouse. Growing in the vegetable garden we have corn, cabbage, squash, tomatoes and strawberries. From this angle of the roof, you can see the vegetable garden as well as the two meadows that divide the mean space of the roof and the backspace, which will be addressed in phase two of the project. To the left you can see more bench seating and below, you'll see the completed product. This summer Native NY Gardens collaborated with design firm Charlap Hyman and Herrero to transform an unrealized Soho terrace into a garden for renowned jewelry designer Monique Pean. Consisting entirely of dark-leaf native plants, Monique's Terrace is truly unique. We selected many of the plants based on their drought tolerance and ability to withstand extreme conditions. Using an ecological design approach, Native NY Gardens has been able to manage the site without an irrigation system. Monique's Terrace has received attention by press such as Surface Magazine which featured the garden in it's September 2016 edition. For this project, we created two rooftop gardens as well as the front yard and tree pit which are shown below. Checkout the video below to get a tour of the other roof! Above is a few photos of the front garden of a building we worked on. The video provides a view from above as well as a tour of the rooftop garden we installed for the same clients. Our clients in Queens wanted a meadow in their front yard and that is what we gave them! As the summer got going, more and more of our native perennials began to flower! When neighbors collaborate, great things happen! The children's garden is a union of two backyards and families with the singular goal of enriching the lives of their children. Native NY Gardens took this opportunity to create a space where the families can grow their own food, have fun in their playhouse, and be surrounded by the beauty of native flora. An open-air play house and two vegetable beds are major components to this garden. They where designed to promote outdoor activities, imaginative games and introduce their children to the practice of growing food. We love to see nature enrich the lives of children and watch children embrace nature as a source of inspiration. That is why we carefully selected plants that would attract pollinators all season long, sustaining local populations. We also installed bird houses, hand painted by the children for our feathered friends, but more importantly as a gesture to welcome wildlife to the garden and creatively celebrate the larger community of living species. A rain garden adjacent to the playhouse collects runoff and provides a dense habitat for visiting wildlife. Perennials such as Joe-pye Weed, Marsh Mallow and New York Iron Weed will grow to tower over the children in an exciting and fun way! Along with having vegetable beds for rotational crops (leafy greens, root vegetables and herbs) we planted an array of wild edibles. 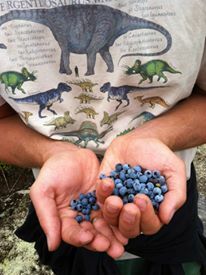 Wild edibles are great because children love to forage, and parents love it when eating healthy becomes fun! In this garden alone, there are High Bush Blueberries, Strawberries, Blackberries, Raspberries, Beach Plums, Elderberries and several rare but glorious Paw Paw trees. One of our projects that we are most proud of is a 120 ft. pollinator garden we planted with the help of some awesome volunteers and park staff. We spent a few days amending the soil and pulling as many weeds out of the area as possible before sourcing all the large plant material, along with some plugs selected by the park's director from Greenbelt Native Plant Conservancy. Altogether the garden was filled with 220 individual plants and over 500 plugs in 10' x 120' flower bed. Come to the park and see what we did! From the moment the plants arrived local pollinators could not keep away! People were in awe by how effective native plants were at attracting bees and butterflies, most of which they'd never seen in the park before. Not only are the pollinators happy but the people are happy too! A sense of community ownership was built around the garden and over night an unrealized site was transformed into a beloved destination. Like all of our projects, we plan for year round interest and wildlife benefits. Long-lived perennials provide nectar, shelter and food for caterpillars and other herbivores. Large swaths of 'power house' bloomers like Anise Hyssop support impressive populations of Bumble Bees and draw in Honey Bees from miles away. Massive displays of color attract butterflies and dense foliage of grasses, and perennials provide cover for migratory birds who then feed on the abundant insect populations. With the support of an open minded home owner Native NY Gardens took a typical Brooklyn backyard (with a play house that the children had outgrown and a lawn in disrepair) and transformed it into an oasis! Over 15 varieties of native trees and shrubs, 30 varieties of herbaceous plants, grasses, aquatic species and moss took root in the garden, giving it a botanical garden type of feel. What would an oasis be without water? (Well not an Oasis at all). For this project Native NY Gardens designed a pond that utilizes aquatic plants as natural water cleaners. Balance of natural systems is vital to any healthy pond preventing algae blooms and repelling misquote larvae. In time we will introduce misquote fish, frogs and turtles to further balance this aquatic habitat. Plant diversity is key for any ecosystem, fruitful oasis or diatomic garden. By understanding how plants function in an ecosystem we can maximize their impact on bees, butterflies, birds and of course, people! Diversity is beautiful and an amazing asset to own. I have called this principle, by which each slight variation, if useful, is preserved, by the term of Natural Selection. More portfolio pieces coming soon!